Today's post features a card I made using one of the newest sets from Lawn Fawn called Sweet Smiles, and oh how adorable it is! One of my favorites from this release for sure!! I stamped the main image onto a piece of PTI Stamper's Select White Cardstock ( my fav) using Memento Tuxedo Black ink, and I used my Copics in pinks and blues to color in my image. 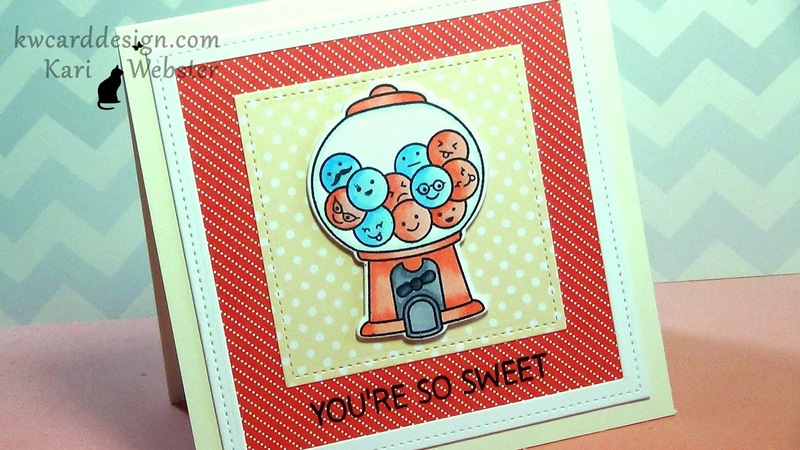 Once I achieved the coloring that I liked, I die cut the gum ball machine using the coordinating die. 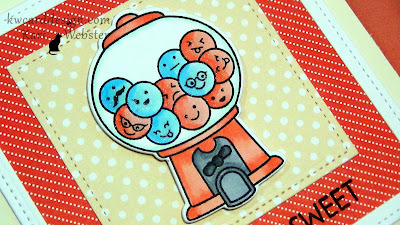 Then, I used several of the faces that come in this set and stamped them onto each of the gum balls. Aren't they just adorable!! Too cute for words! Then, I die cut some pattern papers from both the BeachSide Patterns and Polka Mon Amie 6x6 pads. I both the Large and Small Stitched Square Stackables dies from LF to die cut all of my papers and a piece of white card stock to create a white frame. I stamped the sentiment 'You're So Sweet' from the same stamp set using the VersaFine Onyx Black ink - such a great black ink! Then, I started adhering my pieces together. I added some foam adhesive to my gumball machine, and placed that onto my polka dot pattern paper. I added some liquid glue to my white frame and adhered that to the other piece of pattern paper. Then, I added all of that onto my 5x5 Vintage Cream card base. To finish things off I added some Wink of Stella to the gumballs. Such a fun set!! So - did you pick up this set!! I'd love to hear from you if you did! If you'd like to see how this one came together, the video is below as well! Thanks for stopping by! !